Zone Striping, Inc. is one of only a select few pavement marking contractors to own and operate three high pressure waterblasting trucks. These trucks are used to remove various types of pavement markings, for the removal of curing compound on concrete roadway and airport runway surfaces, and for the removal of rubber build up on airport runways. All three units are the top of the line Model, SH8000 as manufactured by Waterblasting Technology. Manufacturer Training Representative, Wojciech (Voytek) Tiplicki, recently spent four days at our Zone Striping, Inc. facility training additional employees on the safe and proper operation of the SH8000 units. Employees also received training on maintenance schedules and procedures as well. The result is that Zone Striping, Inc. now employs seven full time “Stripe Hog” Certified Operators. 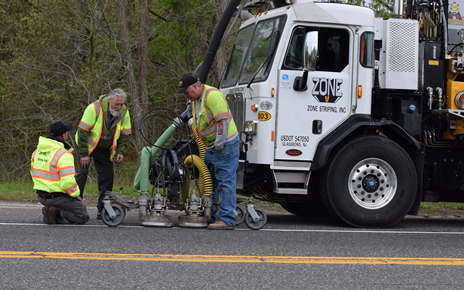 The additional “Stripe Hog” operators now allow Zone Striping, Inc. the flexibility to run this equipment 24 hours a day, seven days a week, if necessary, to keep pace with customer needs and project demands. Click here to see more about Hydro-Milling (Water-Blasting).